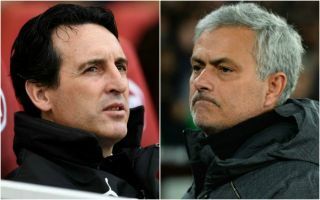 Arsenal manager Unai Emery needs to play both Pierre-Emerick Aubameyang and Alexandre Lacazette up front against Manchester United this week, according to ex-Gunner Paul Merson. Emery’s side looked superb against Tottenham when they changed to using two up front, coming from behind to win the North London Derby 4-2 at the Emirates Stadium. Aubameyang scored twice and Lacazette once against Spurs, and it seems a no-brainer to have two of those in-form strikers playing against what has been a hugely suspect United defence. The Telegraph also list a long number of Red Devils players who could miss the Arsenal game, including a number of defenders struggling with injury, while Ashley Young is suspended. It remains to be seen how Emery will approach the game, with a gung-ho approach perhaps unwise at Old Trafford, especially given Arsenal’s poor record at the ground, but Merson seems to make a good point about trying to repeat what worked so well in the win over Tottenham. Prediction for the big game? ‘In the past we’ve seen Arsenal go to Old Trafford in form, play well but somehow still end up losing the game,’ Merson told Sky Sports. ‘However, unless Manchester United really pick their game up or the Gunners hit a brick wall after their efforts against Tottenham, I just can’t see how United win. I really can’t!